Self actualization is a mental state of pure happiness, one where you allow yourself to transcend beyond the physical realities of our world. It could be best described as the ‘next-level’, above that of a balanced life. For me, it’s the idea of achieving a balanced life and pushing these components even further. In this article you will learn the 4 key characteristics of self actualized people and how each characteristic translates into living a rich life. Download this ebook: [Empowering Beliefs: Develop Conscious Mind Power To Achieve Anything]() – and discover what you can do today, to become a self-actualized person. I feel the most important characteristic of self actualized people, is their desire to give back, through any means necessary to their community and the groups of people who helped them achieve their goals. This isn’t simply a one-off ordeal, but a life-long stance towards helping those less fortunate than themselves to achieve their dreams as they helped them to accomplish their own. Whether this is through customers purchasing their products or spreading their work. It can also be thought of as the reverse-engineering of a balanced life. Starting at the top, and working your way down, helping the people who are still on their journey, just like you were back then. There is quite a distinction between a balanced life and the self actualized life. An individual who has achieved a balanced life has obtained the goal of stability and contentedness in their life. However, someone who has reached the state of self-actualization has made it their personal mission to become the best person they can possibly be, and this ties in perfectly with the art of living. Comfortable acceptance of self, others, nature – Self actualized people accept their own human nature with all its flaws. The shortcomings of others and the contradictions of the human condition are accepted with humor and tolerance. 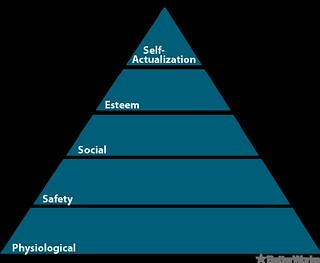 Task centering – Most of Maslow’s subjects had a mission to fulfill in life or some task or problem outside of themselves to pursue. Humanitarians such as Albert Schweitzer and Mother Teresa are considered to have possessed this quality. Autonomy – Self actualized people are free from reliance on external authorities or other people. They tend to be resourceful and independent. These are the traits which stick out most to me, because I resonate with them extremely well. It pains me to say the following, but I’ve never met an individual who could claim to have achieved a balanced life, let alone self actualization. This disheartens me somewhat, because I have witnessed many people take on the quest towards achieving a balanced life – with none having actually reached it. As a person who is on the quest for a balanced life and self-actualization thereafter, it would be rather funny if I ended up being the only person I personally ever knew to achieve such a feat. As a final note, I belief that if everyone strove to reach the state of self-acualization, whether they were famous or unknown, rich or poor; the world would be an extremely peaceful, loving place. Over 7 billion people – yet only 0.0001% of us are willing to set aside our personal interests to try and solve an issue on an epidemic scale. I’m just glad that this kind of work is my personal interest too – it just makes everything that much easier. Generalist vs Specialist - Which Is Better For Your Career?